Evan is currently a Polar Bear Research Scientist at Environment Canada. Polar bears (Ursus maritimus) have a circumpolar distribution, the southern limit of which is determined by the annual distribution of sea ice during the winter (1). Polar bear life history is intimately linked to the sea ice environment, with sea ice providing the platform from which bears hunt, travel, mate, and in some areas den (2). Over the last 20 years, in association with climate warming, there have been significant declines in both the spatial and temporal extent of sea ice cover in the Arctic (3,4,5,6,7). It has been suggested that spatial and temporal changes in the sea ice environment will result in reduced availability and abundance of the polar bears primary prey, seals (8). In turn, reduced prey availability has the potential to influence the life history of individuals (growth, reproduction, and survival) (9) and thereby the population dynamics of polar bears. 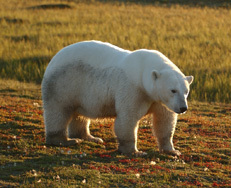 The effects of reduced availability of prey are already becoming evident at the southern limit of the polar bear range in western Hudson Bay. Polar bears in this area are forced ashore during an extensive ice-free period each summer in which bears fast for up to 4 months living on stored fat reserves. Increasing spring temperatures and earlier sea ice break-up dates have extended this period and resulted in significant declines in the body mass of adult female polar bears (10,11). Declines in individual phenotypic quality (eg. body mass) will have an effect on population recruitment, as lighter female polar bears produce smaller litters and lighter cubs (12) that are less likely to survive (13). This is just one example of how sea ice-mediated changes in individual phenotypic quality could influence polar bear life history traits and population dynamics. During my dissertation I examined the effects of interannual variability in the sea ice environment on individual phenotypic quality, life history traits and population dynamics of polar bears in western Hudson Bay. This study involved the use of 28 years of mark-recapture data from the western Hudson Bay polar bear population collected by the Canadian Wildlife Service and the University of Alberta. Currently, this is the only polar bear population in the world for which detailed long-term demographic data exist to examine the complex relationships between sea ice dynamics, life history traits and population dynamics of polar bears. Understanding how variability in the sea ice environment affects polar bear life history traits and population dynamics is crucial for predicting the potential long-term impacts of climate warming on this species. I am originally from Winnipeg, Manitoba where I completed my undergraduate degree in Zoology at the University of Manitoba. I began working in western Hudson Bay 10 years ago as an undergraduate student doing research on arctic and red fox den site selection. 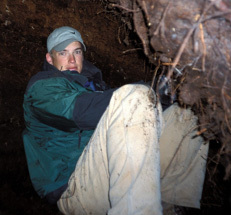 In April of 2001 I moved to Edmonton, Alberta to pursue a Masters of Science at the University of Alberta with Dr. Ian Stirling, focusing on polar bear maternity den site selection in Western Hudson Bay. 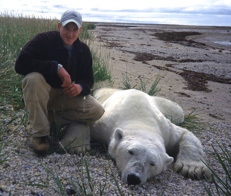 After I completed my Master’s work I continued to work on polar bears with Dr. Stirling, this time as a wildlife biologist for the Canadian Wildlife Service conducting polar bear research in the Beaufort Sea and western Hudson Bay. In January of 2007 I also began my Doctoral studies at the University of Alberta. References: (1) Demaster, DP and Stirling I. 1981. Ursus maritimus . Mamm. Species 145:1-7. (2) Amstrup, SC. 2003. Polar bear (Ursus Maritimus). Pages 587-610 in Feldhamer, GA, Thompson BC, and Chapman, JA. Wild Mammals of North America: Biology, Management and Conservation. (3) Comiso, JC (2002) A rapidly declining perennial sea ice cover in the Arctic. Geophys Res Lett 29:1956 (4) Comiso, JC and Parkinson CL. 2004. Satellite-observed changes in the Arctic. Physics Today 57(8):38-44. (5) Parkinson, CL and Cavalieri DJ. 1989. Arctic sea ice 1973-1987: Seasonal, regional, and interannual variability. J. Geophys. Res. 94(C10):14,499-14,523. (6) Parkinson, CL, Cavalieri DJ, Gloersen P, Zwally HJ, and Comiso JC. 1999. Arctic sea ice extents, areas, and trends, 1978-1996. J. Geophy. Res. 104(C9):20,837-20,856. (7) Stroeve, JC, Serreze MC, Fetterer F, Arbetter T, Meier W, Maslanik J, and Knowles K. 2005. Tracking the Arctic’s shrinking ice cover: Another extreme September minimum in 2004. Geophys. Res. Lett. 32, L04501 . (8) Derocher, AE, Lunn NJ, and Stirling I. 2004. Polar bears in a warming Climate. Integr. Comp. Biol. 44:163-176. (9) Boggs, CL. 1992. Resource allocation: exploring the connections between foraging and life history. Funct. Ecol. 6:508-518. (10) Stirling, I and Parkinson CL. 2006. Possible effects of climate warming on selected population of polar bear ( Ursus maritimus ) in the Canadian Arctic. 59:261-275 (11) Stirling, I, Lunn NJ, and Iacozza J. 1999. Long-term trends in the population ecology of polar bears in western Hudson Bay in relation to climatic change. Arctic 52:294-306. (12) Derocher, AE and Stirling I. 1994. Age-specific reproductive performance of female polar bears ( Ursus maritimus ). J. Zool. (Lond.) 234:527-536. (13) Derocher, AE and Stirling I. 1996. Aspects of survival in juvenile polar bears. Can. J. Zool. 74:1246-1252. 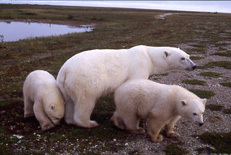 Female and cubs-of-the-year in western Hudson Bay. coast of western Hudson Bay.